As a corporate employee, I traveled to lots of exciting places—saw the airport, inside of cabs, and hotels. However, I got to try a variety of fruits and dishes new to me. 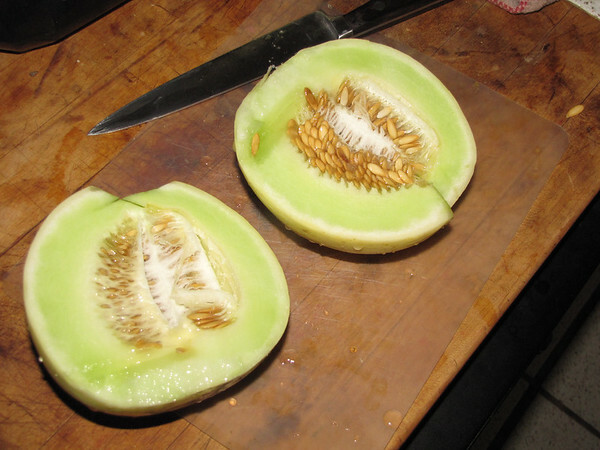 One was HoneyDew Melon–and it was love at first bite. I discovered it can be either wonderful or so-so. This year I decided to try my hand at growing some. I harvested three melons–one the size of a baseball, and two somewhat larger. Here is the largest one opened—and it was so-so—-but still fun to say I grew it myself in my raised garden beds. Next year should be better, I now have water to keep everything well watered.